Fiction University: What's On Your Desktop? Yes, this is a cop out post, because I think I'm coming down with something (or the 5000 pollen count is sending me into allergy haywire). I had planned to write a post on bulking up your novel, but getting two words to string together well is an effort at the moment. But tomorrow, I'll do that post for ya. Unless this really is the start of the flu or something, then I'll be out for a bit. I'll leave drinks and snacks in the fridge just in case. Help yourself. 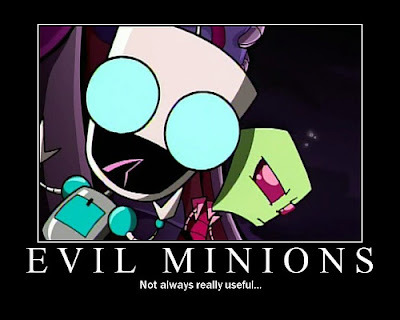 I love, love, LOVE Invader Zim. I was so sad when they stopped making it. Feel better soon! I often feel that way on days when my body is doing just fine. Feel better soon. Take a rest from blogging tomorrow if you need to. We'll understand. Must be something going around - feel better soon! *hug* I've not been feeling the best, myself, but I think that's just the insomna. Thanks all, feeling so much better now. I even have Dog-Gir shoes! My husband found them online for me. They're so adorable.